Flat roofs offer a rugged durability as they are designed to hold weather elements and downed tree limbs rather than pitching them off. The same strength which allows for these functions is also capable of providing structural support for mechanical devices such as outdoor heating and air conditioning units or backup generators. Although the flat roof can be used for housing or other small buildings, its strength and durability makes the flat roof have a general association with large commercial buildings. 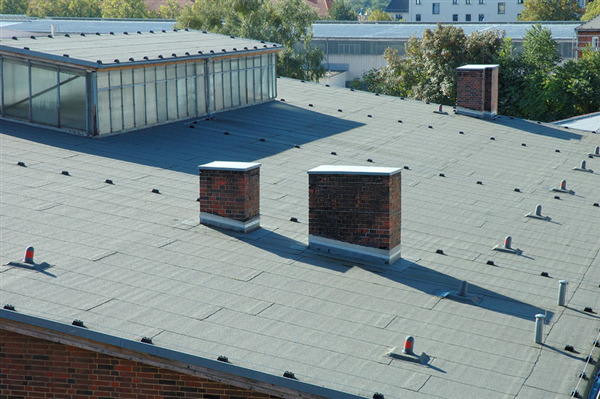 Depending on local weather and the intended purpose of a building, there are multiple applications of a flat roof by considering various styles and brands of finishing it. TPO (Thermoplastic Olefin) roofs can be rated for Energy Star efficiency by reflecting solar heat in the summer to reduce cooling bills or hold heat in the winter for improved heating efficiency. Rubber roof membranes provide superior weather resistance and are typically covered with smooth gravel as an extra layer of protection. Duro-Last roofs provide one of the most inexpensive roof coverings when considering the price and the number of years it is expected to last. Flat roofs require very little maintenance. Often, maintenance is as simple as re-spreading the gravel covering once per year to even it out. Occasionally, every roof needs to have the sealant around chimneys and vents refilled and the flat roof provides easy access to perform what is a simple job without the dangers inherent in walking on a pitched roof. All told, flat roofs are a great option for any building with an architectural design which allows for the aesthetic of flat roofing lines. Since there are different styles and options, it’s important to discuss with your roofing contractor what their experience proves will work best for your situation and how best to begin the project.